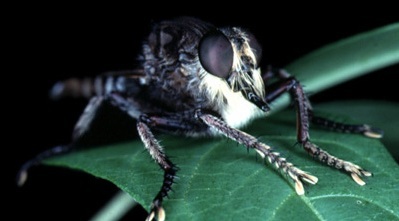 Region: This fly is found in various species throughout North America. Life cycle: This insect produces one generation each year and requires at least one full year to complete its life cycle. 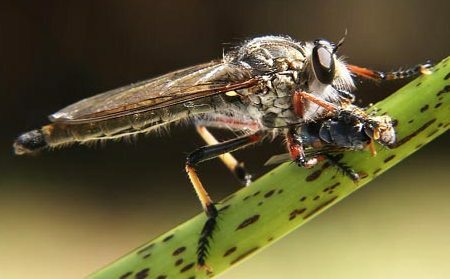 Physical Description: These large, 1/2 to 3/4 inch long, powerful flies are gray, but occasionally can be found as yellow or black. They have a stout beak, a hairy mouth and produce a loud buzzing sound. The larva is white, flat, and cylindrical. The whitish eggs are laid in the soil or on plants. Feeding characteristics: This particular fly is beneficial to growers either as an adult fly or as a larva. The subterranean larvae eat grubs, Beetle pupae, and Grasshopper eggs that happen to cross their path. The adult flies attack such winged insects as Butterflies, Moths, Beetles, Wasps, Bees, and Grasshoppers by capturing them on their wings. Controls: No controls are necessary. In fact, you can attract this fly by planting flowers that bloom throughout the growing season.